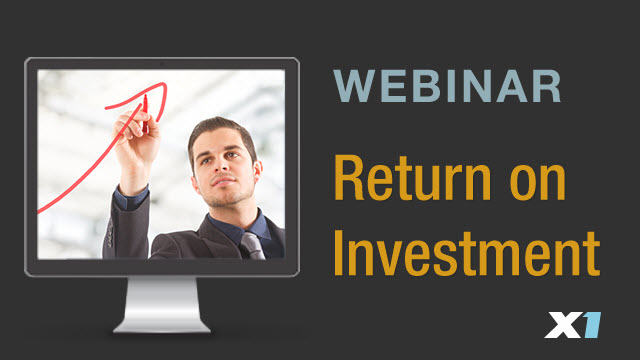 The holy grail of enterprise software is the achievement of positive return on investment (ROI). If the technology happens to be user-friendly, that is a nice bonus. Such a combination can be tough to come by, but smart organizations are learning that business productivity search can not only pay for itself, but also drive more value by making workers more efficient and effective. Join us for a complimentary webinar that will show you how to make the business case for business productivity search. Our special guests, Dante DeWitt, former CIO of Wells Fargo and Bank of Montreal, and productivity expert Sue Becker, will provide real-world perspectives and best practices for business productivity search. Dante will illustrate how business productivity search provides meaningful ROI in a way that traditional enterprise search cannot. While Sue will share some of the horror stories of how the explosion of digital information has made us less productive than we can be. Sue will also offer some strategies and best practices for remaining productive by mixing process and technology together. Such productivity is especially important in today’s information economy. Given the enterprise workforce is more mobile than ever before, using multiple devices in any location, workers need access to applications and information on-the-go. Enter award winning X1 Search Mobile, the new addition to X1’s enterprise search platform, enabling full email and desktop search from mobile devices, keeping workers productive anytime, anywhere. X1 Search Mobile is the first solution of its kind. Attend this product tour with live Q&A to learn more. Fear not, however, there is a way to make enterprise search work by putting the end-user search experience first. Attend this “no-death-by-PowerPoint” webinar, to learn how to actually make enterprise search work for your business. Our special guest, Marcus Stimler of Cap Gemini, will also share real-world experience about evolving an enterprise search strategy that starts with the business workers and extends outward. Learn how Cap Gemini put together a number of “wins” by providing workers with a single-pane-of-glass view to their most important information. Join Amazon Web Services (AWS), LTech, an AWS Partner Network (APN) Consulting partner along with X1, a leader in search for virtual environments for a discussion on user-friendly enterprise search solutions on the AWS cloud. Learn how LTech and X1 deliver solutions that allow organizations to quickly search, identify and act upon distributed data, whether it resides within the enterprise or within AWS. See how X1 unifies search across all critical business data such as local emails & files, webmail, network files share, SharePoint, MS Exchange, PST files and more. Gain insights into unified search coupled with LTech's design, management, development and implementation of Enterprise Cloud Strategies complement the combined products to suit your needs. For IT departments, the benefits of virtual desktop infrastructures (VDI) are clear - enabling secure and efficient BYOD, streamlining IT administration, and reducing operational costs. The success of any VDI rollout, though, depends upon end-users embracing their new user experience in virtual environments. Because best practice dictates disabling Windows indexing to ensure optimal resource performance, end-users tend to be frustrated by poor search experiences. With X1® Search 8 Virtual Edition, it is possible to avoid disjointed search experiences and deploy VDI in a way that enhances end-user productivity. Watch the Webinar recording to hear Citrix and X1 search experts discuss on how to harness the benefits of VDI while maintaining and improving end–user productivity. An increasing number of organizations are realizing the benefits of Virtual Desktop Infrastructures (VDI). VDI provides the flexibility that enables organizations to achieve their business goals while controlling technical operational costs. However, as with any solution, there can be trade-offs and limitations, some of which can impede the success of VDI deployments. One such limitation is the near-inability to search user content in many virtual desktop environments. As a result, users may not be as productive and in extreme cases, frustrated users can slow or block VDI adoption entirely. X1 solves this problem by integrating its leading search application with VDI deployments using solutions from Citrix and VMware. X1 significantly enhances productivity and reduces user frustration, enabling organizations to realize the full benefits of any size VDI deployment - from the small and medium size businesses to worldwide enterprise deployments. Join search & IT strategists, Jody Elkins, Vice President at Agile360 and Michael Devin, Vice President of Search Solutions at X1, in a complimentary webinar to learn about a game-changing search capabilities in a VDI environment. As Microsoft SharePoint continues to gain wide adoption amongst enterprises, large and small, with enhanced content management and collaboration tools and simplified workflows, effective management of eDiscovery within SharePoint is now a pressing concern among legal counsel and corporate IT departments. Legal counsel face unique challenges when searching and collecting data from SharePoint that can lead to increased costs, overlooked data and other pitfalls if not handled properly. Join Reed Smith attorney Patrick Burke and X1 executive John Patzakis in a complimentary webinar to learn about this critically important topic and new ground-breaking methodologies to address these eDiscovery challenges. - Understand standards and requirements for proficient eDiscovery of data stored in SharePoint sites. Thought-leadership webinars highlighting current business trends for enterprise search and eDiscovery. Register for our live webinars or explore the on-demand content. Learn more at X1.com.